As first detected by German publication WinFuture, Microsoft has pushed a “portable computing device” through to the FCC (Federal Communications Commission) in the US, that's likely to be a new Surface tablet. 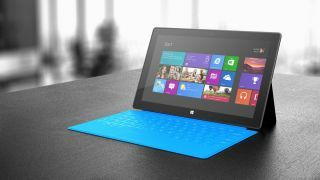 Microsoft has been rumored to be developing a budget Surface tablet with a 10-inch screen and USB-C for $400, aimed at tackling the iPad market with its more portable and lightweight design. Meanwhile, the next true iteration of its Pro line, tentatively titled the Microsoft Surface Pro 5, has been rumored to be landing in mid-2019, which suggests that the lightweight model mentioned above is indeed what we’ll be seeing first. The FCC filing refers to the product as Model 1824 and doesn’t have any mention of updates or changes to an existing certified device, which rules out the chance of a mere update or reconfiguration of existing Surface tablets, and cements this as a new hardware product. Within the documents, there is a previously-unheard of battery from the same manufacturers that handled the last generation Surface Pro batteries, further hinting at a new product in the Surface line. There’s also mention of a 24W power supply – two-thirds the power of the existing 36W supply for the Surface Pro – which heavily suggests this is a more lightweight and economical tablet. However, this “portable computing device” (a term Microsoft used in its regulator applications previously to describe the Surface line) may be sporting an Intel-based CPU rather than the Qualcomm ARM processor we previously thought a cheaper Surface model would receive. WinFuture notes that the application mentions a discrete Wi-Fi Bluetooth chipset manufactured by Qualcomm, a component that would otherwise be integrated into the processor if it were to be manufactured by the same company. While we’re not positive when this new Surface will see the light of day, an FCC listing usually implies that the product will be announced shortly afterward, and an included confidentiality agreement that lifts on December 28 suggests we’ll definitely see an announcement before the year is out.